In this section we look at how to plan a birthday party for adults with ideas for fun party themes for adults and simple tips for how to plan a great party that your friends will be talking about for ages. The birthday of a loved one is arriving and you have decided that you want to host a party to celebrate this special occasion. While you can just get a cake and some balloons and call it a day, if you want the party to really be a memorable one, you will need to do a little more planning to pull it all together. Here are some tips that you can use as a birthday party planning checklist to help you successfully plan a great birthday party for adults. Pick a Date and Time. The first thing that you will need to do is pick a date and time for the event. Pick a date and time that is near the actual birthday of the guest of honor – it doesn’t have to be on the exact birth date. Pick a date and time that is convenient to everyone and select it at least 2 months in advance of the event. While you don’t have to have a theme for a birthday party, having one can certainly make the event feel even more special. If you opt for a theme, pick something that you know that the guest of honor will love. Pick something that is age appropriate; princesses for a little girl and a black and white party for an adult, for example. Tie the theme into different elements of the party; décor, food and activities. Select a menu for the party. Decide if you will be serving an actual meal, or if you want to simply serve finger foods and desserts. As a rule of thumb, if the party will be held during prime lunch or dinner hours, serving meal-type foods is appropriate; you don’t have to have a sit-down dinner, but you can serve a buffet of different meats, pastas and vegetables, for example. Sure, the guests at the party will mix and mingle and they can certainly make their own fun, but in order to ensure that all are having a good time, include some planned out activities. For instance, you can have a scavenger hunt, or play some of the more popular adult party games like Charades or for young adults, maybe the more physical game of Twister. Having activities will avoid boredom and will help to ensure that the party is moving in the right direction. If you want to plan a memorable party that your guest of honor is sure to remember, follow these easy-to-use tips and you will enjoy a memorable party. Just because you have come of age doesn’t mean that you have to put away your party hats and noise makers when your birthday comes around. There are plenty of reason to celebrate the birthday of an adult; and in the fast-paced lives that adults live, a birthday party is a great excuse for a much needed break from the daily grind to experience some fun. If you are an adult who is hosting your own birthday party, or you are throwing a birthday party for another adult, here are some fun adult-friendly birthday party ideas that will keep the guest of honor and the party guests entertained. You don’t have to live on a tropical island to have a luau; you can have one right in your own backyard to celebrate an adult’s birthday. For a luau-themed party, get out the inflatable palm trees, the grass skits and the leis to set the island mood. You can also set up tiki torches to add a bit of tropical flare. Serve frozen drinks in coconut cups and dance the night away to some feel good, island-inspired music. Spend the evening incognito at a masquerade party. When sending out invitations, let guests’ know the theme of the party and ask them to dress the part, or you can purchase masks and hand them out as guests arrive. For the décor, think rich colors that create a regal feel, such as amethyst and ruby and incorporate the hues in the linens, tableware, balloons and table decorations. You can simply have guest mix and mingle, or you can create an elegant flare by having a masquerade dance, in which guests’ alternate partners throughout the dance. Relive the good ol’ days by throwing a retro-themed party. Simply select a decade that you love or the one that the birthday celebrant was born in for this party – the 50s, 60s, 70s or 80s, for instance, though an decade can be recreated with the proper décor and props. Bring in elements from the chosen decade, such as disco balls and disco music for the 70s or poodle skirts and leather jackets for the 50s. Serve food that was popular during the chosen decade, play music from the era and you can even play games that were popular during the decade of choice. These theme ideas are sure to make any adult’s birthday party extra special and extra fun. 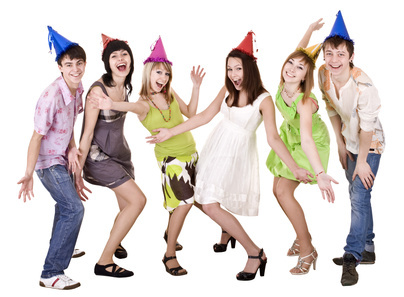 Whether you are young or old, a birthday party is an event that everyone looks forward to. These special events mark the specialist day in a person’s life – the day that he or she was born – and a fun-filled celebration is always a great way to celebrate. If you are hosting a birthday party for a loved one and you are on a budget, here are three great location ideas that won’t break your budget and will serve as a fantastic setting for a memorable event. A park is a great location to host a birthday party. Kids will appreciate the wide, open spaces and the playground equipment that a park has to offer. Adults will like the natural setting and the limited time constraints that a park offers. The host of the party will like that price tag – which is often free, though sometimes a small fee for clean-up is necessary. If you are interested in hosting a birthday party in a park, find out details beforehand, and of course, have a plan B in place, in the event of inclement weather. A house is another inexpensive location to host a birthday party. The party planner can host the event in their own home, or the party can be held in the home of someone else. The price tag for this venue is free – and of course, the only time constraints are the ones that you put into place. If the party is for a child, however, make sure that all breakables are put away before the event to prevent any accidents from occurring. No, no; not an extravagant catering hall, which will surely have a hefty price tag attached, but rather a church, a Knights of Columbus or any other such type of public hall. Often your local Community Centre will have meeting rooms or small venues they will hire out for a tiny fee. While there will be a price tag attached to this type of venue, the amount is small compared to those huge catering halls. These halls often have a lot of space and usually provide tables and chairs. You also usually have access to kitchen facilities so that you can heat or chill foods and keep the catering hygienic and safe. If this party venue interests you, just call in advance to set up a date and time, to find out the fees and any other information that you may need to know. So, there you have it; three great and inexpensive venue ideas for a birthday party that are sure to please. While your children probably have no idea what the 1980s were like, you most likely do. Hosting an eighty’s themed party for adults can be a lot of fun, for everyone involved. The ideas you need to pull the party off are below. If you are going to allow movies to be watched at the party, they must all be out of the 1980s. Some of the most popular include: Dirty Dancing, Back to the Future, Ghost Busters, Footloose, Pretty in Pink and Ferris Bueller’s Day Off. If you aren’t thrilled with the idea of movies, you could show some of the most popular television shows made in the 80s, like: Growing Pains, Smurfs, Thundercats, etc. What’s a good party without music? For a 1980s party, you’ve got to play the “hits” of the era, such as: Culture Club, Duran Duran, Michael Jackson, etc. Additional entertainment could include busting out the old Atari game console and showing the kids what a “real” video game is. Even playing games like Pac-Man would be fun. As you know, records and 45s were very big parts of the 1980s. So, visit a thrift store or flea market and buy some old records and 45s and decorate the walls with them. You can use pastel colored streamers to hang from the ceiling as those were the “in” colors during that particular decade. One of the most fun aspects of hosting a 1980s party for adults is getting to dress up like they are from the 80s. Wearing leggings, fluffy skirts, hoop earrings, high heels is easy for girls. Boys often wore the classic black sunglasses, tight jeans and t-shirts. And don't forget the bouffant hair do's and lots of hair spray for both men and women! For a 1980s party, ideas include: Rubik’s cubes, bangle bracelets, smurf figurines and “Jelly” bracelets. Therefore, to host a true 1980s party, you’ve got to serve foods such as cheesy corn chips, pizza, Fritos, all kinds of Dips with chips, and finger foods ruled! Cheese platters were at every party, and even some chocolate fondues were popular. Remember that the 80's was the decade of extravagance! We drank Bollie, Moet, Krug - and any other expensive champagne that trendy at the time, so pop the corks and bring out the champagne flutes! Perhaps you’ve heard of murder mystery parties held for adults? Below are a few ideas for how you can host a successful murder mystery party. Many people choose to have a murder mystery dinner and a murder together. If you don’t feel like your house is big enough or in the right location for hosting the dinner, then you can check into booking a local space or even a park. To make the dinner feel “formal” have formal wine glasses filled with wine. You may also want to find a volunteer to serve appetizers and keep the glasses filled during the dinner (this would be the butler). While guests don’t have to speak in front of everyone, it is fun for the more outgoing guests to dress in costumes and read certain parts to make the murder mystery more real. Hosting a Wild West murder mystery can be a big hit. You can get the party started right with your decorations. For dinner, serve traditional western food such as chili, beans and cornbread. A few famous characters that you may want to incorporate into your murder mystery may include: Annie Oakley, Buffalo Bill or Billy the Kid. Giving your guests murder mystery games to play is a great way to keep the murder mystery theme going. In fact, the entire party can revolve around these games. Just make sure you’ve decorated appropriately and are serving the right foods to tie in with the particular theme you’ve created. Royal murder mysteries are a lot of fun, especially if you’ve got your guests looking for the traitor who killed the King or Queen. Or, maybe you’re guests have to determine where one of the King’s special guests went? Popular foods to serve include: biscuits, cookies, cakes and tea. A few characters that need to be present include a prince and/or princess and a duke and/or a duchess. Younger guests may think that they are coming to a magic party where they will be entertained with magic tricks. However, the night will take a turn for the worst when someone actually disappears during the magic show. If you don’t know exactly how to hold a murder mystery from start to finish, that’s okay. There are tons of murder mystery kits available for purchase. Most of these kits will give you instructions for everything (invitations, party favors, murder details, etc.). I'll be searching out and finding some of the best party planning supplies and other party resources to make sure your party is the best ever! Soon I will load some of my party planning and party games how to books here for you to download. And when it comes to stocking up on party favors and party decorations, you can't beat the variety of party supplies that you can buy online nowadays. A special bonus is that you save all that legwork going from store to store when you order online, and they deliver to your door - WOOT! Be sure to let me know if you liked the suggestions in here for how to plan a slumber party kids will love, and please leave a comment in the FB comments section. You can also share your best tips for how to plan a slumber party kids sleepover in the submission box below and you will create a site page of your own! Do you have a tip you want to contribute here? Share it! Entering your tip is easy to do. Just type! You should visit the HOME PAGE if you want to find more fun guides for things like this how to plan a birthday party for adults section that you read here.